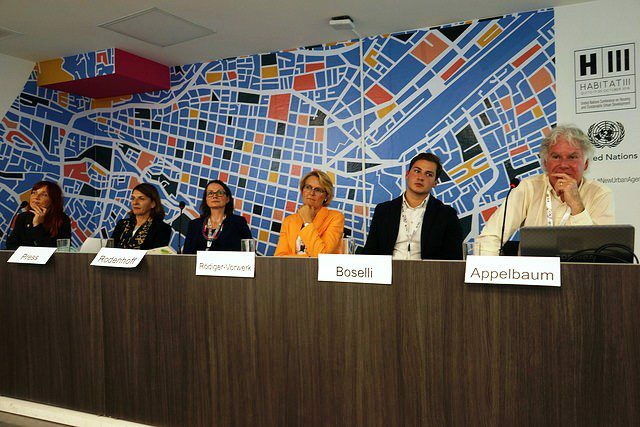 This week marked a big opportunity for ICLEI USA member cities to share their experiences with the global community at Habitat III, the United Nations Conference on Housing and Sustainable Urban Development. From October 17-20, 2016, leaders from local governments around the world gathered in Quito, Ecuador, to determine the roadmap for urban development and sustainability during the next 20 years. Among the cities sharing best practices in sustainability were ICLEI USA members Boulder, CO, Oakland, CA, and Santa Monica, CA. Boulder was recognized as a 2016 Capital of the Earth Hour City Challenge during the 2nd World Assembly of Local and Regional Governments. Boulder demonstrates its leadership through partnerships with residents. Boulder citizens voted to renew a carbon-cutting tax and implement recycling citywide during the past year. “Local governments are closest to the people, understand the critical importance of these sustainability goals and are leading the way in implementing them,” Boulder Council Member and ICLEI USA Board / North American Regional Executive Committee Member Matthew Appelbaum said as he accepted the award at a Habitat III ceremony. Santa Monica City Council Member Pam O’Connor spoke to ensure issues of social and climate equity were central to the conversation during a side event hosted by ICLEI and the World Resources Institute. Council Member O’Connor, who also serves as ICLEI USA’s Board Vice-Chair and is a member of ICLEI’s North American Regional Executive Committee, explained how Santa Monica uses a data-driven well-being index to evaluate differences between neighborhoods and groups. This information enables the city to identify factors that contribute to well-being and to target resources to overcome inequality. “We are ensuring everyone has the opportunity to thrive in Santa Monica,” Council Member O’Connor said. 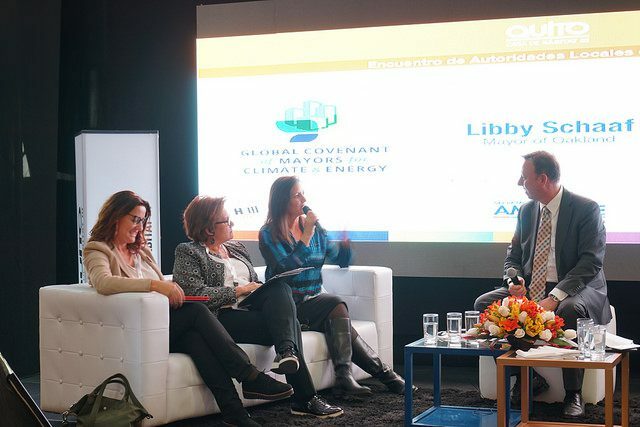 City of Oakland Mayor Libby Schaaf spoke about Oakland’s efforts to build resilience into city planning at the conference’s Official Urban Dialogue on Ecology and Resilience and on Oakland’s innovative climate actions at a Global Covenant of Mayors for Climate & Energy event. Mayor Schaaf also expressed her sustainability and equity commitments to a gathering of more than 385 local and regional leaders at the 2nd World Assembly of Local and Regional Governments. Habitat III is the third in a series of bi-decennial conferences on housing and development, beginning in 1976 in Vancouver, Canada and continuing with the second (Habitat II) in Istanbul, Turkey in 1996. This year, ICLEI gathered 120 local governments from more than 40 countries at Habitat III to make sure the voices of city leadership informed conference outcomes. Some of the commitments ICLEI made ahead of the conference include to act as a training and capacity-building engine for local government action on climate and sustainability, ensure ICLEI’s efforts address real challenges faced at the local level, and to report ICLEI member communities’ sustainability success stories. Click here to read about all of ICLEI’s Habitat III work. There will be much work to do to implement the spirit of Habitat III through on-the-ground action, but already local governments in the U.S. are producing results to achieve greater community resilience, equity, and community-driven sustainability — results made evident by the recognition Boulder, Oakland, and Santa Monica received in Quito. This entry was posted in CityTalk USA and tagged Boulder, California, Colorado, Compact of Mayors, equity, Global Covenant of Mayors, Habitat III, oakland, Quito, resiliency, Santa Monica, United Nations. Bookmark the permalink.